Home Alarm over Ethernet: What are Your Options? 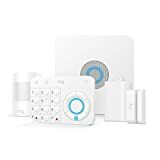 Many home security companies including Protect America have been promoting their wireless systems, which offer the perks of easy and less expensive installation costs. But for your business or luxury home, security experts still suggest that you go with a more traditional security system where each sensor and camera are hard-wired into your network via your Ethernet ports. Why is that? A wireless security system depends on the strength of your WiFi signal to maintain a connection with each sensor point and camera in your network. It’s also easy to add an extra point with plug-n-play equipment. However, your router’s signal may only extend to your kitchen, but not the back door. Suddenly you have to buy another router or reposition your points. When you use Ethernet, you will have to run wires and cables to each point but you won’t experience drop-off of the wireless signal. Each camera will remain connected as long as your network is powered. Also, it is a more secure connection that is less susceptible to hackers being able to take over your network as the network is maintained completely through the cabling. There have been recent upgrades with IP (internet protocol) cameras and power-over-Ethernet cabling that eliminates the need to connect each surveillance point to a power source. While you used to have an electrician add extra outlets to power up your home security system, now you only need to run cabling–saving time and expense during installation. Furthermore, with network video recorders that collect digital images instead of the analog signal of older systems, you can add all those extra angles you wanted without blowing the budget or having to purchase a much more expensive multi-plexer unit. Now, while the cost of installing all the extra cameras and door sensors is much lower these days with advanced technology, there can be a big drawback when you jumped the gun and bought the massive package of surveillance equipment. Your monthly monitoring contract is likely to skyrocket when you include video, fire, water, and motion sensors to that basic price that looked so attractive. In order to get the home or small business security system you really need, it’s a good idea to discuss your specific requirements with an expert, like the Customer Service agents at Protect America. They can help you decide which features you really need, if an Ethernet-wired system is right for you, and which service will work best with your budget.